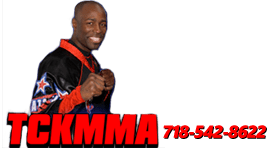 TCK Mixed Martial Arts provides the opportunity to learn mixed martial arts in a comfortable but challenging atmosphere. Our curriculum, which is a blend of various martial arts, is designed to give you the best and most complete instruction possible. Each discipline contributes a unique aspect to your training, making you a well-rounded martial artist. Additionally, what you will discover is that martial arts can provide an unparalleled workout. This type of training is something that cannot be found in any gym or fitness club. In each class you are learning a new kick, punch, drill, form, boxing pattern or self-defense technique. Each workout is different, exciting, practical, and taking you one step closer to becoming black belt. Our professional and highly skilled staff provides you with the necessary steps to develop balance, coordination, flexibility and strength. Our philosophy of martial arts extends beyond physical aspects. We emphasize the universal principles of success and the connection between your mind, body and spirit. These standards lead our students to overall personal development and well being. Our adult martial arts students range from ages 14 to 70, and although we are determined to see each student to succeed, we encourage them to progress at their own pace. Just fill out the short form on the side of this page to get more information on how you can sign up for one of these amazing martial arts programs.